*Apologies for the horrible pics of the skirts. My usual photographer had already left for work so I had to make do with mirror self-portraits. I bought some of that gorgeous fabric in your blog header last week - one of favourites. wow...you were quite productive indeed! 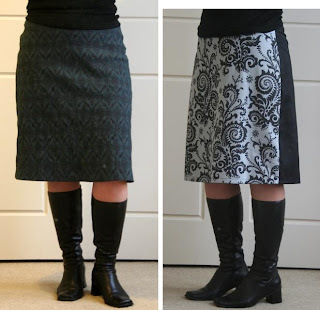 Love the skirts - especially with those boots! Rock On! love the skirts - what pattern is that? email me - kimberleyrothwell@yahoo.co.uk. I'm just learning to sew and am obsessed with making the perfect a-line skirt ..